1. Is a self-storage facility renting space and is not a warehouseman or garageman. 2. Is not responsible for loss or damage to stored personal property. 4. Requires that I provide my own insurance coverage or be “Self-Insured” (personally assume risk of loss or damage). By signing below, I understand and agree to my insurance responsibilities. 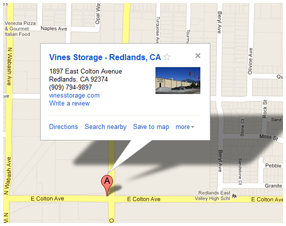 Vines Storage Located at 1897 East Colton Avenue, Redlands, 92374, CA. Phone: (909) 389-6209. http://www.vinesstorage.com/.